Kate Wilhelm was one of my teachers at Clarion in 1988. I’m not familiar with her story, “Ladies and Gentlemen, This is Your Crisis!” but I know her work opened up science fiction characters to the psychology of real human beings. It was Kate who taught me to really go there in fiction. So if we’re not in the UK at the end of June, Kelley and I will most certainly be at the Ethnic Cultural Center in Wallingford for the opening night. We would be at the fundraiser, too, if not for a previous engagement. But you should go along: just $20 (or, y’know, more if you’re feeling flush) will get you an hour of mingling with the glitterati (the geek literati) followed by Greg Bear’s performance and discussion of Kate’s story. 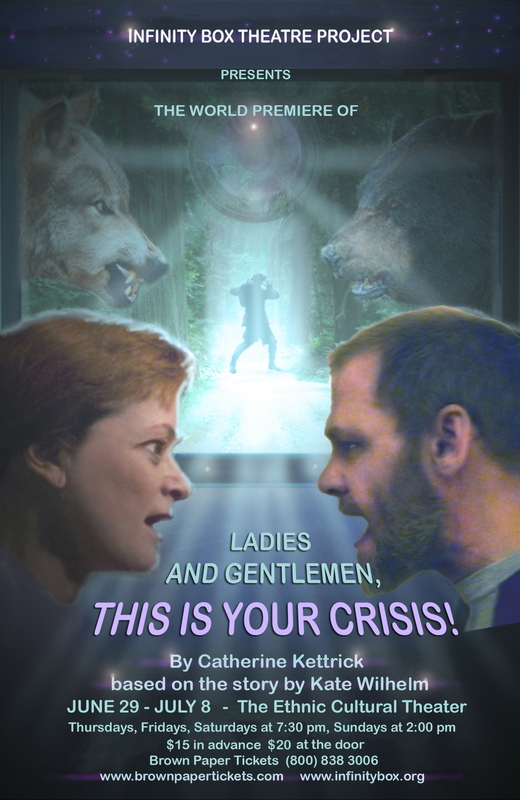 Infinity Box Theatre Project invites you to join us at a fundraiser for our production of the world premier adaptation of Kate Wilhelm’s short story, Ladies and Gentlemen, This Is Your Crisis! Reception from 7:00 to 8:00 pm; Reading begins at 8:00. Ladies and Gentlemen, This Is Your Crisis! will open Friday, June 29th, at the Ethnic Cultural Theater, 3940 Brooklyn Ave. NE, Seattle.